I was in a band as a teenager. The most notable thing about us was the fact that we blagged our lighting rig from Bauhaus. All I remember about those gigs is being so blinded by strobes that we just turned up the volume and hoped for the best. I turned to writing once we went our separate ways, but never lost interest in making music. So, in between books over the last few years, I've returned to my first love. 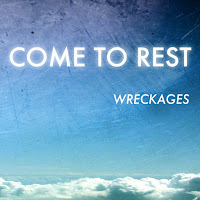 Wreckages is an instrumental project available for free streaming and download. All tracks on this first release, Come to Rest are composed, performed and produced by me, on and off from 2013 - 2015. The last two tracks contain samples from street recordings, and come to you with a parental advisory label. Rock and roll.